On behalf of Jessica, Ian and Jason I want to wish you all a happy and healthy 2014! Thanks so much to everyone who took the plunge and become Members this year and to everyone who renewed. Your support helped me to create nearly 40 new renders this year! If all goes according to plan 2014 should be memorable one for DB. Jan 17 - 19 Jessica and I will be attending our very first SFF convention in Seattle. I will be the Artist Guest of Honor and will be leading my first ever panels on digital art. I hope to show off a few of my tricks with my trusty mobile workhorse Asfaloth. What else? One way or another I will have an iOS app before the end of the year. The groundwork has been laid now I just need to get it finished. That same groundwork may also result in upgrades to the DB site and the Android app, along with a number of 3rd party apps being compatible with my gallery. There is also a possible corporate "partnership" that I have been working on for the past year. I am really crossing my fingers that it works out in 2014. I have been working with the new version of Vue d'Esprit and the new "Plant Factory" over the past few weeks. I am learning that these programs can produce spectacular results, but I have to figure out how to optimize my scenes so that don't take a week to render. TL;DR -- Enjoy "Campfires" as the newest free wallpaper and have a wonderful New Year!! 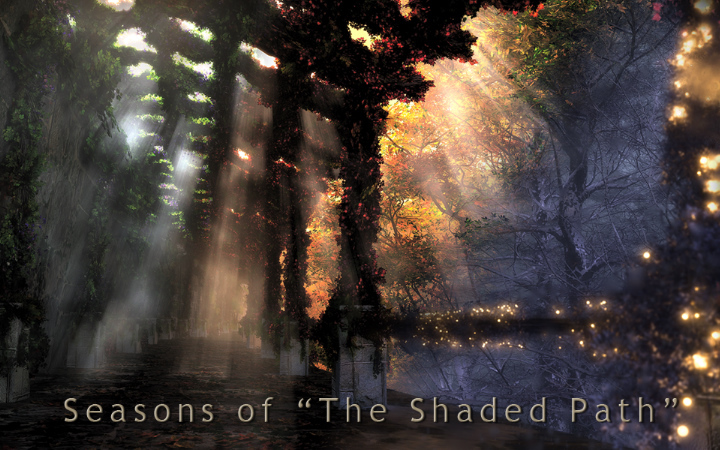 While putting together a page to list the different seasons of "The Shaded Path" I thought it would be interesting to combine them into one image. I don't usually post Photoshop collages here in the gallery but I've added this one by request. 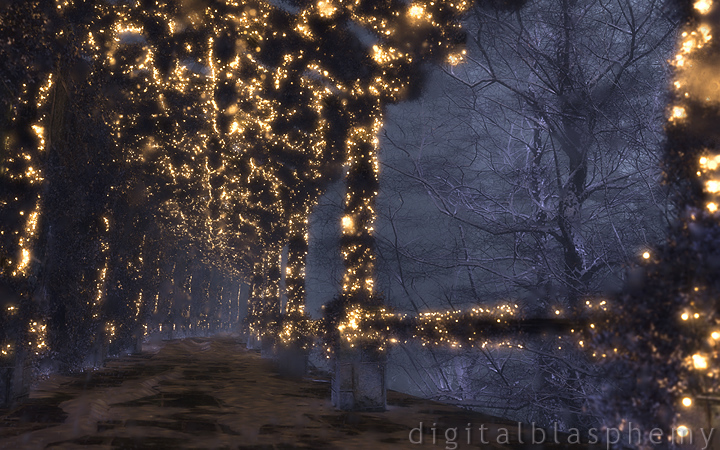 I've added a Winter/Night version of "The Shaded Path" to the Members Gallery this morning. This one actually took longer to put together than both of the previous versions and I am still not 100% pleased with how it turned out. Rather than sit on it for another 4 or 5 days while I made adjustments, however, I've decided to let you guys be the judge. This was to be my first scene rendered using the new version of Vue d'Esprit (Vue 2014) but a few showstopping bugs sent me back to my "trusty" Vue 11. Perhaps I will be able to go back to Vue 2014 for the day version (I would love to the use new "photometric" atmosphere). Stay tuned over the weekend! A have a couple of renders going right now and the first one finished was my multiscreen version of "Perseverance". I am not 100% happy with how this one came out so don't be surprised if I get it an update in the near future. The render took quite a while on Asfaloth however so I offer it here until I can rework things. 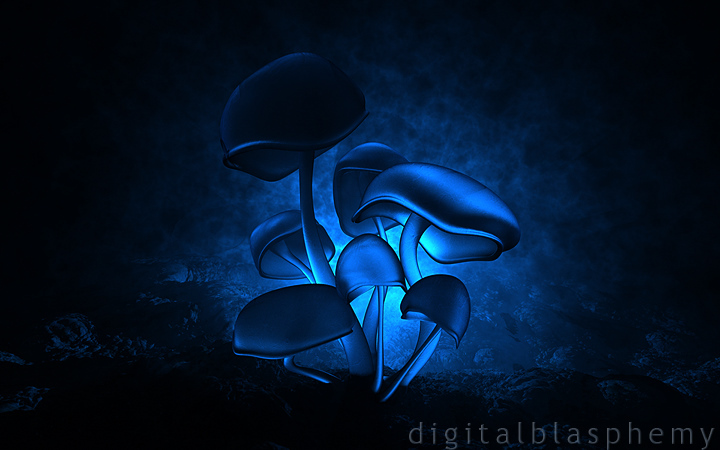 I was curious as to how my "Fluorescence" mushrooms would look with only back lighting (rather than glowing themselves). Not sure if this one deserves its own place in my gallery or not, but I think it makes a nice wallpaper nonetheless. I rendered this one using Asfaloth while Bucephalus worked on "Perserverance". Let me know what you think! 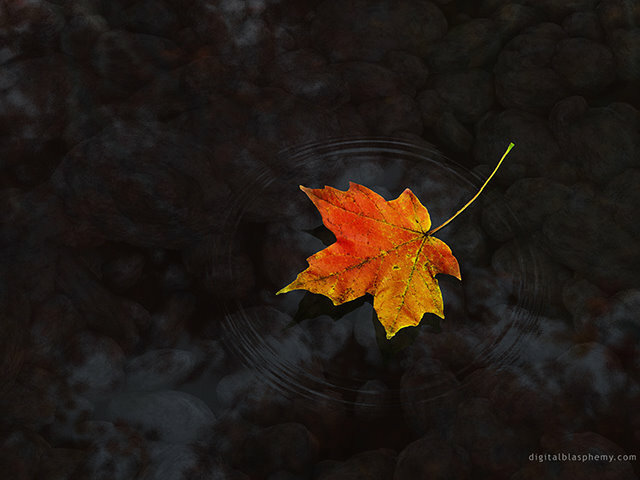 Members can download my newest render, "Perseverance", from my New Images page this morning. I've had this image rattling around in my head for about five years now and I'm happy to finally let it out. This one is still in the early stages but I thought it looked nice enough to share. It's still pretty raw so stay tuned for updates! Here's the original "Traveller" from 1998 if you are curious. 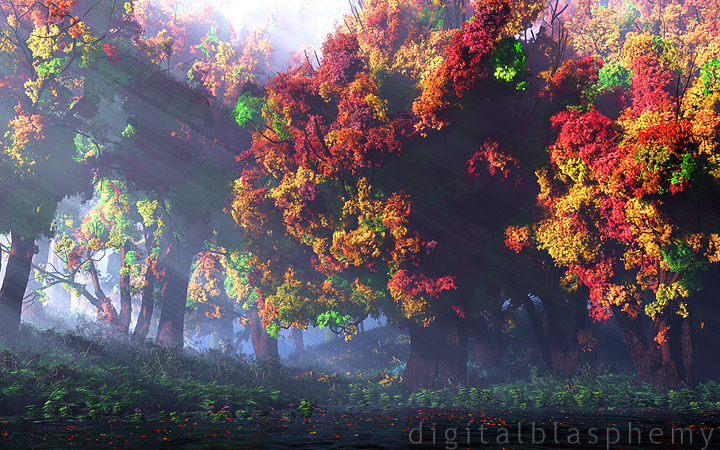 I've added my second version of "Morning Glory (2013)" to the Members Gallery this morning. Mostly fine tuning here since the first draft was pretty well received. Maybe one more render to go. Let me know what you think so far! EDIT: I've added the dual and triple-screen versions this morning. Let me know what you think of the new composition! I have two new interviews available online now. The first is a Q&A I did with the nice folks at AMD Gaming about how I was enjoying my Radeon 7990. The second is a more in-depth profile published this month in "3D Art Direct". I don't overlap a whole lot so I hope you will read both. Feel free to share any comments or questions you might have in the comment thread below! 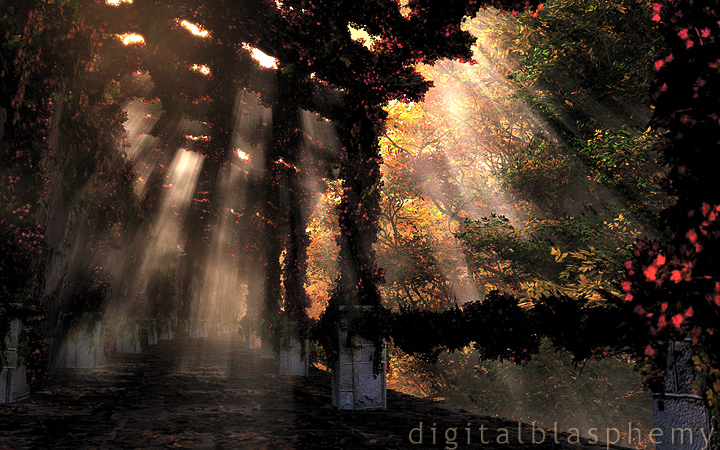 I've added an Autumn version of "The Shaded Path" to the Members Gallery this morning. I am still playing around with the light and colors in this one so expect to see a few Pickle Jar versions before all is said and done. I think like this better without the blur now. The first versions will remain available in the Pickle Jar. Let me know what you think of the changes! I would also like to welcome the newest Digital Blasphemy licensing partner, Barproducts.com. They contacted me a few weeks ago about featuring my work on various bar supplies and the first products are now online. I chose and positioned the artwork for these six personally. I hope you like them! These bottle openers are just the start of course. Take a look at the rest of the products and let me know where we need to go next! I've added a new version of my Halloween render to the Members Gallery today. I have gone back to my original blue color scheme (with pale orange moonlight), added runes to the main structure, and some more vegetation to the dias. I went with a new title for this piece also. While I intended this piece to illuminate the pagan roots of Halloween/Samhain, I didn't mean to cast them into such a negative light. Here is another "doodle" I put together on "Asfaloth" while my main workstation was rendering. I was trying to learn Lightwave's new "Fracture" toolset. The first two renders will remain available in the Pickle Jar. The multiscreen is rendering right now and but will look a bit different...stay tuned! Here is a little doodle I put together on Asfaloth while my main machine was rendering Panoply. Nothing too fancy, just trying to visualize the famous couplet in the song by Deep Purple ("Smoke on the water and fire in the sky..."). I've added v.2 of "Panoply" this morning and I am sure some of these changes are going to be controversial. Unfortunately there was a bit of a file mishap and my original scene file for version 1 was scrambled and un-usable so this is what I have for the time being. I've toned down the lightbeams a little and also desaturated things a bit. It was mentioned that I should cut out the purple/burgandy tones but I wanted to explore those a bit more for this version (sorry!). I still need get the bottom of the frame sorted out. Let me know what you think of the update! I've added my first Autumn render of the year, "Panoply", to the Members Gallery this evening. I have long wished the Vue d'Esprit would allow for varying the foliage colors on individual trees but sadly that feature hasn't arrived yet. I'm trying a new technique here using Vue's new "360" instancing to create "Ecosystem" trees. Basically I've planted thousands of smaller trees onto larger tree models (trees are fractal by nature after all) and varied the colors that way. Let me know what you think. I haven't perfected the process yet but I like the results so far! Look for an update in the days ahead. I've added my "final" version of "Gazebo" to the Members Gallery this morning. For this render I've made the structure transparent again but added subsurface scattering to give it a bit of backglow. 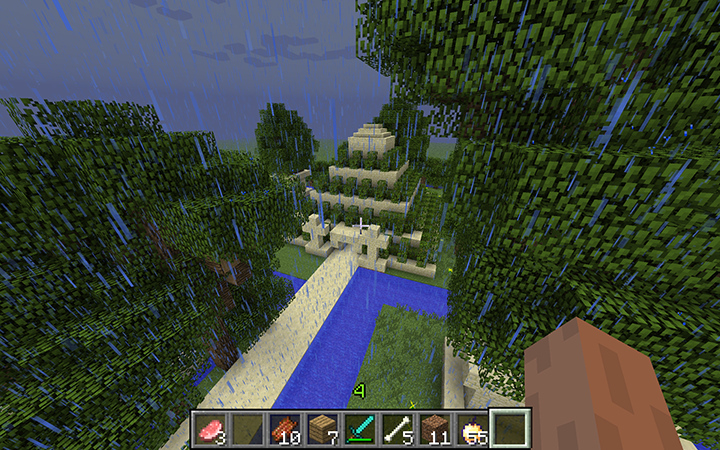 I've also trimmed down the vegetation at the base. This was by far the longest of the five renders (the other four are available in the Pickle Jar) so let me know if it was worth it. In other news: I've started on a my first Autumn render of the year. I'm trying out a new technique for making even more realistic fall foliage. Stay tuned!! Introducing the Digital Blasphemy Site License! Want to provide a nice perk to your office or group? Purchase a Digital Blasphemy Site License and you can share my artwork on your private network. Everyone in your office or workgroup can enjoy my wallpapers without each person having to purchase a Membership of their own. Please see here for the rules and restrictions. After adding "Gazebo (2003)" to the Free Gallery last week I shocked to realize that it had been 10 years since I released that piece. A number of folks asked if I could do an updated version. Members can now download my first crack at it here. I chose to view the scene from inside the "gazebo" this time to get around the problem I always had with the structure covering up my sky elements. I've added a new way to support my artwork beyond a simple Membership, print purchase, or tip donation. Become a DB Supporter at the Donor, Patron, or Sponsor level and I will post your organization's (Twitter handle, whatever) on this page, the front page, and the free gallery page. You will also have a permanent listing on a special supporter page on DB. There are signed prints and canvases available for the Patron and Sponsor levels. Sponsors can get their names listed with my free gallery wallpapers ("Brought to you by..."). I am open to suggestions as to other benefits that might be appropriate. Please let me know in the comments section what you think of my idea and if you have any ideas on improving it! 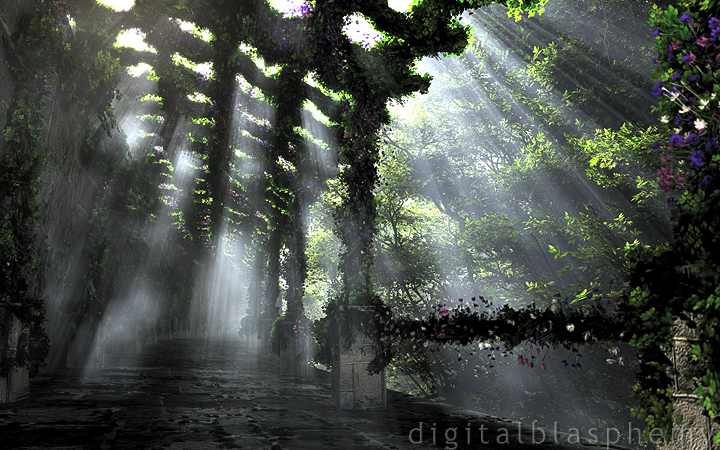 Added "The Shaded Path" to the Members Gallery this morning. Dual and triple-screen versions also availble. I was recently asked how I spent my birthday. When I told her I spent the day working she looked at me sideways as if to say "That's Too Bad". Actually I can't think of a better way to spend my birthday, especially when so I am so pleased with the results. 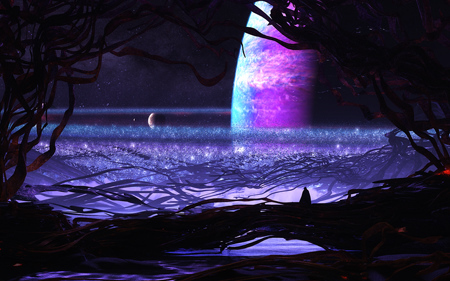 I spent that day creating the pieces for this scene in LightWave 3D and then I assembled them using Vue d'Esprit. The scene has been rattling around in my head for a long while after seeing a random photograph online. This piece is dedicated to Jessie's Mom and Dad. We visited them recently and were blown away by their incredible hanging garden. Seeing their handbuilt creation inspired me to finally create the geometry. I've only worked on this piece for a couple of days so check back for possible updates. I hope you enjoy it!! 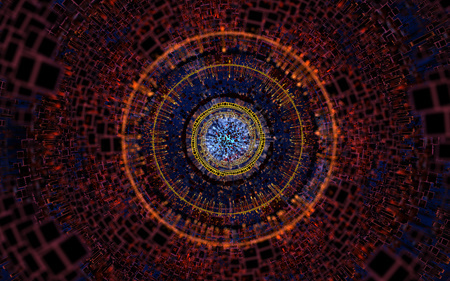 I've posted "Hivemind (Nucleus)" for dual and triple-screen monitors this morning. In other news I am celebrating my birthday today! Here's a little render I put together on my laptop while waiting on my other machines. 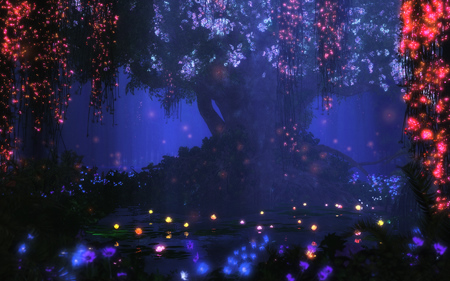 I thought it would be interesting to zoom in on the glowing water lilies from "Satori (Alien/Night)". Unfortunately the DOF blur didn't turn out quite as I had hoped resulting in an image that is a bit out of focus. It a shame because it took quite a while to render too. From the "Art is never finished, only abandoned" department... It occurred to me that the underwater lighting technique I used for "Geode" might yield interesting results in my "Moonlit Oasis" scene. I wasn't disappointed! I've rendered a version with green water (in the Pickle Jar) and one with a bluer pond. Which do you thinks works better? Dual and triple-screen versions also available! I've also finished a multimonitor version of "Hivemind". Enjoy! 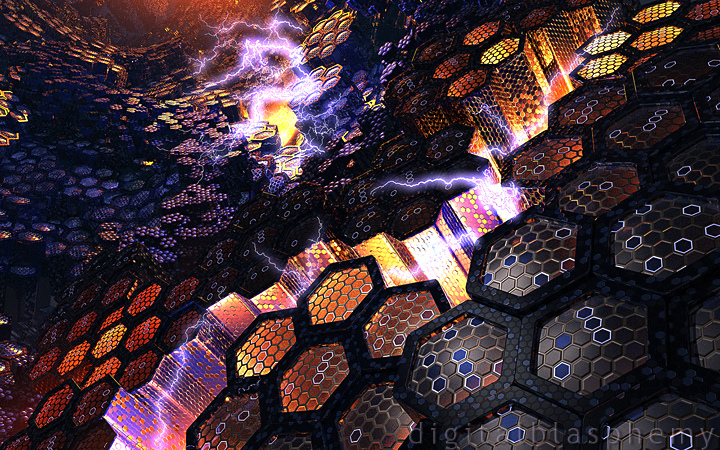 Added an update to "Hivemind" in the Members Gallery this morning. I've done quite a bit of tweaking on this one over the past few days but this is my first render which I felt was an improvement over the first version (which will remain in the Pickle Jar). 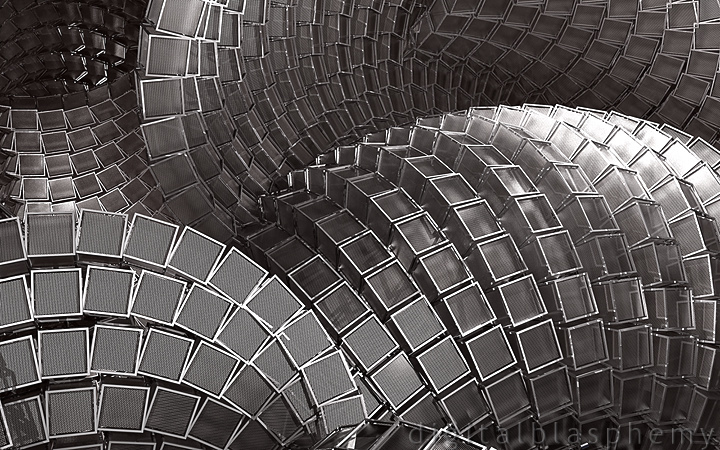 I'm continuing here with the "techno-abstract" theme of "Automata" and "Waveform" here. 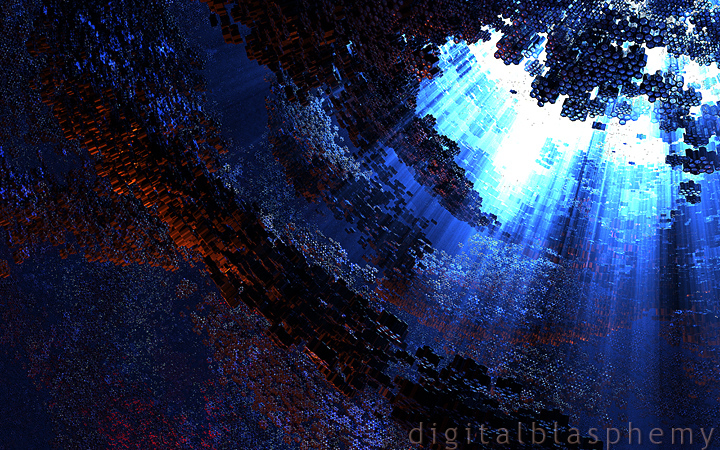 Lightwave 11's new instancing system opens up a lot of possibilities! See also Latticework and The Comb. 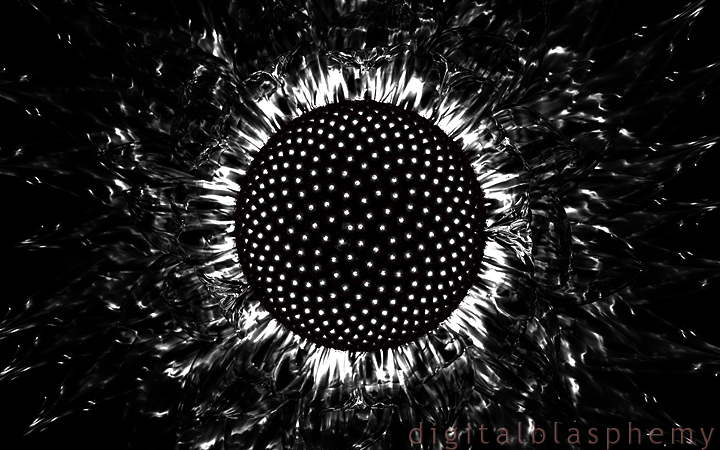 I've also added a blacked-out version of "Sunburst Daisy" in the same vein as "Dark Fluorescence". What other pieces do you think would benefit from being blacked out? Lastly I wanted to announce my first ever Referral Program. Earn between $1 - $5 for every Member you send me! 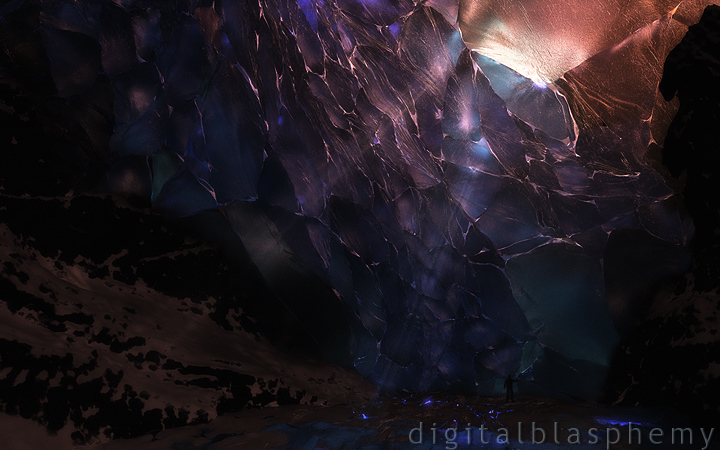 I've added an updated version of "Geode (2013)" to the Members Gallery this morning. The first version had a rather busy cave wall texture which I think detracted from the whole. It may have worked before I put the crystals in but it definitely was too much after. The new version has a simplified wall texture, which is also a bit darker so hopefully you can see your icons better. The first version will remain available in the Pickle Jar. I've also added one more version of "Waveform" to the Pickle Jar. It was suggested that I try a monochrome version and I think it does look intriguing. Dual and triple-screen versions are available to Members. Enjoy! 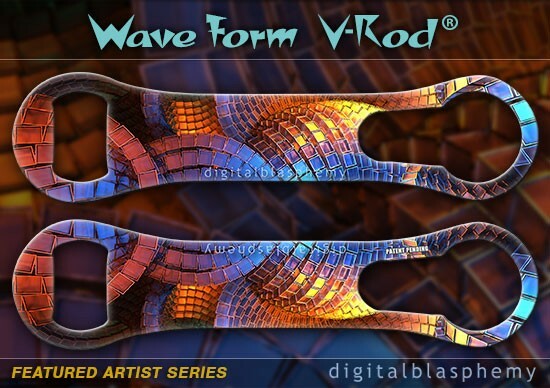 I've added dual and triple-screen versions of "Waveform" to the Members Gallery this evening. I also have a new Vue d'Esprit render cooking which Members can preview on my Work-In-Progress page or through my new Instagram account. Ten years ago this morning my life changed forever. To be honest I can barely remember life before I became a Dad. 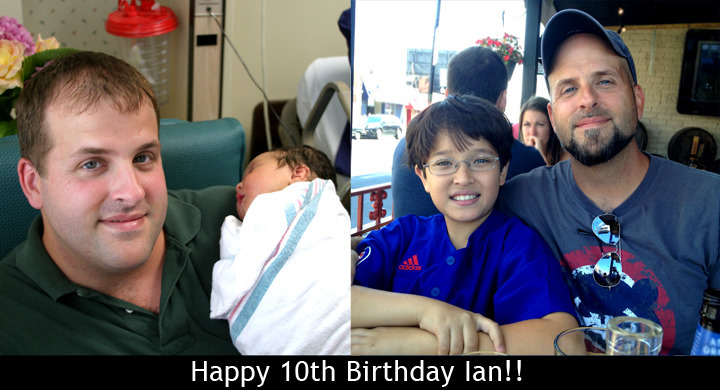 What I do know is that I could not be more proud of how Ian has turned out so far. To my Members I want to say a special "Thank You" for allowing me to be a "stay-at-home Dad" for these past 10 years. Those times weren't always easy, but I wouldn't trade the memories for anything. PS: I've posted a new work-in-progress for my Members to check out. Hope to have it ready sometime this week! Asfaloth has been busy rendering the multiscreen version of "Cave of Arches" for the past few days and I have another new project rendering on Bucephalus. Fortunately my old Macbook Pro is back in the mix with a new logic board from the nice folks at the Apple Store so I can still do a little bit of art! "Waveform" is my first project built and rendered on the rebuilt MBP (which I have decided to name "Silver"). The geometry was modeled using Structure Synth (the same program I used for "Synthestructure") and the scene was rendered using Lightwave 11.6. This piece follows the same "techno-abstract" theme that spawned "Automata". This piece is a little less complicated though. I hope you like it!! Here is the multiscreen version of "Cave of Arches" for my dual and triple-screen users. I hope you enjoy it!! Congrats Amy and Heath and thanks for sharing! 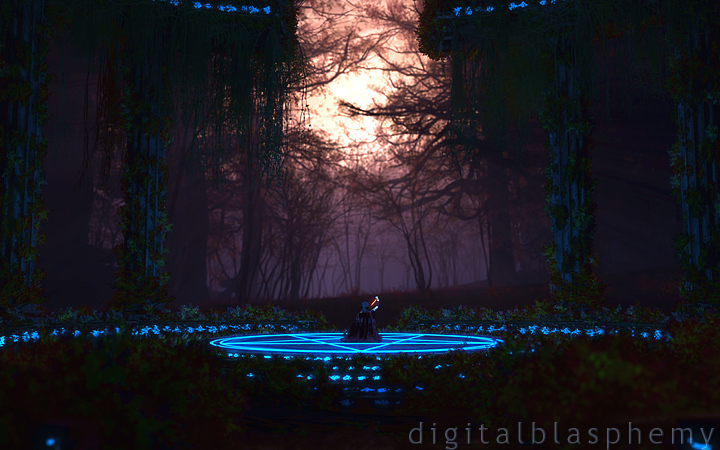 Added "Automata" to the Members Gallery this morning. I created this piece as part of a possible corporate partnership with a large semi-conductor company. They asked that I put together some technology oriented images for use on large multi-monitor displays and this is my first salvo in that effort. Dual and triple-screen versions are available! Even if they decide this piece doesn't work for their campaign I think it deserves a place in the gallery. I modeled the structures using "Structure Synth". The textures are all Lightwave procedurals and it was rendered using Fprime. It was certainly fun to make! I will post various photos there that catch my fancy, including views of works in progress before they hit the site. I may cross-post a few to my Twitter and Facebook accounts but I recommend following me if you want to see everything. Members can still download the hi-res previews of my Works-In-Progress here, but this should be an easy way for non-Members to keep tabs on my activities. A few weeks ago the nice folks at Rustycon (who will be flying me out to Seattle as their Artist Guest of Honor in January) asked me about a piece with dragons to be used on the cover of their flyer. The theme this year is "A Festival of Dragons" so I thought it might be fun to add some dragons to my "Cave of Arches". Not sure if the Rustycon folks will use this piece or not, but it was fun to make even if it only ends up in the Pickle Jar. Let me know which version you prefer! 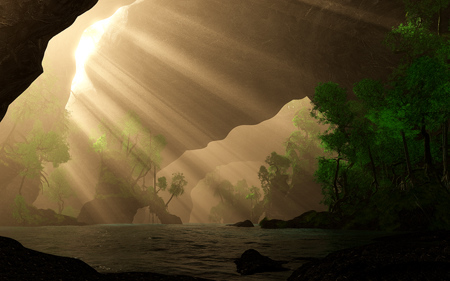 I've added a 4th version of "Cave of Arches" to the Members Gallery, with the focus on improving the foreground. I've added some trees, mushrooms, and other some other flora. I've also added some light action on the foreground water. As I mentioned last time, my "Returning Member" discount has been finally discontinued. Members can still renew their current Memberships at the same discounted rates, but if you let it expire you will need to sign up as a new member. I've also added a poster version of "Elegy (Winter Day)" to my Zazzle collection (by request). Here's a huge "premium canvas" version also if anyone is interested. I created a brand new 7680 x 4800 render (109 hours on Asfaloth!) just for this print. 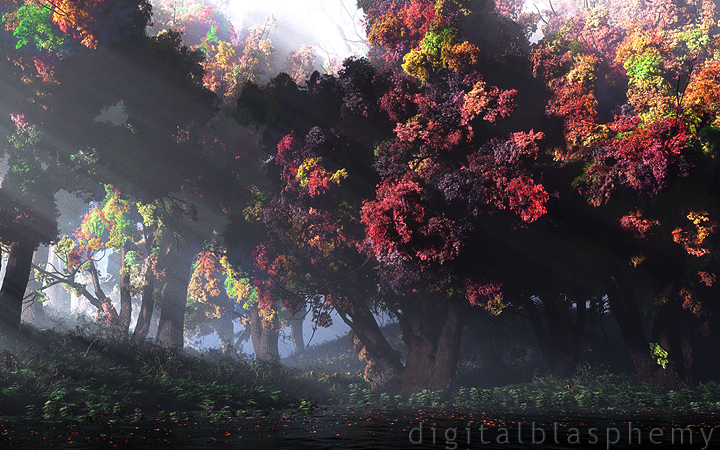 For the new render I corrected some of the colors in the foreground branches and I will be replacing the version in my gallery with this new one shortly. Download it now if you want to keep this version! Former Members: I just wanted to let you all know at my "Returning Member" discount will be discontinued as of midnight Friday 7/19/13. If you are former Member and would like to take advantage of the $10 off discount you can still do so here. Just check the box and the discount will be applied to all yearly and above Memberships. The discount works on the honor system so you need not enter the email address you used before. Let me know if you have any questions, comments or concerns. In happier news...fortune has smiled upon me and allowed me to reopen the scene file for "Cave of Arches"! I was able to work on it yesterday and rendered a new version overnight. I've added some new vegetation and changed up the lighting a little bit. There are some other tweaks that I will leave for you to discover. I'm not sure how happy I am with all of the changes (see my incomplete first draft in the Pickle Jar) so there may yet be one more render before I move on to the multiscreen. 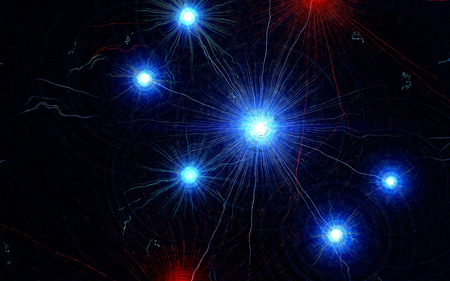 In addition to the dual and triple screen version of "Starburst" (thanks to Scott Rose for suggesting the new name!) there are a few of Pickle Jar renders that I wanted to highlight. Back in November I started a scene using a brand new beta version of Vue d'Esprit. The scene was coming along nicely and I was able to produce one test render, but it crashed after that and I was not able to reopen my scene file. I had originally thought to put this render in the Pickle Jar (for lack of a better place) but my Members liked it so much that I've given it a place in my gallery. Maybe someday I will be able to reopen the file or have the energy to recreate the scene somehow. Hope you like it regardless! I've also added two "new" renders of "Axiomatic" produced without the bright center glow. I created these for an update of "Mystic Halo" that is in the works. 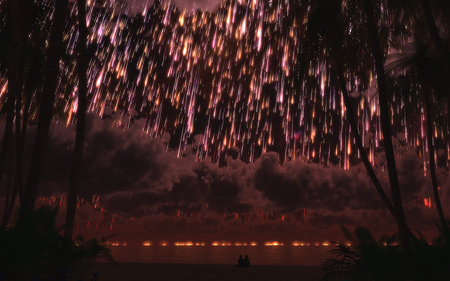 I created this alternate version of "Starfall" partly to celebrate the 4th of July, but also for those people who wanted to imagine a happier fate for the couple on the beach. I might play around with the fireworks a bit more before I post a multiscreen. "I painted four of your pics on a block of wood. I hope this isn't too far down the limb from hi tech... But I haven't been inspired to paint lately and your any media contest sparked my creativity up. " 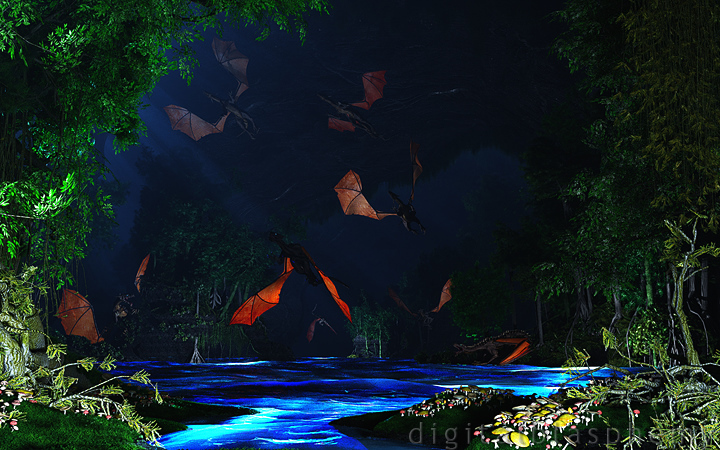 The original renders are...Fluorescence (Bloom),Reverie, ,Tropic of Cancer, and First Moonlight. A couple of items to report today. 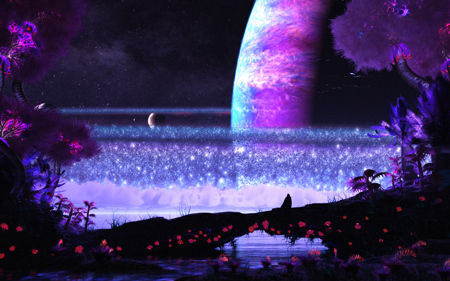 First, I have added my "final" version of "Starfall" to the Members Gallery this morning. Dual and triple-screen versions are now available as well! The changes are pretty subtle. I gave the couple a blanket to sit on but decided against adding the wine. I will leave the rest for you to discover. The original version will remain in the Pickle Jar. I hope you enjoy the update. Be looking for the multiscreen soon! I also wanted to announce a new art contest! 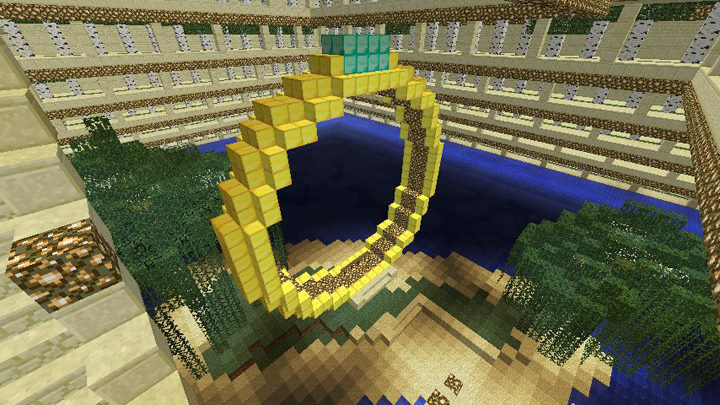 As with the Minecraft Contest, the object is to recreate one of my images. This time you can use whatever means you like. 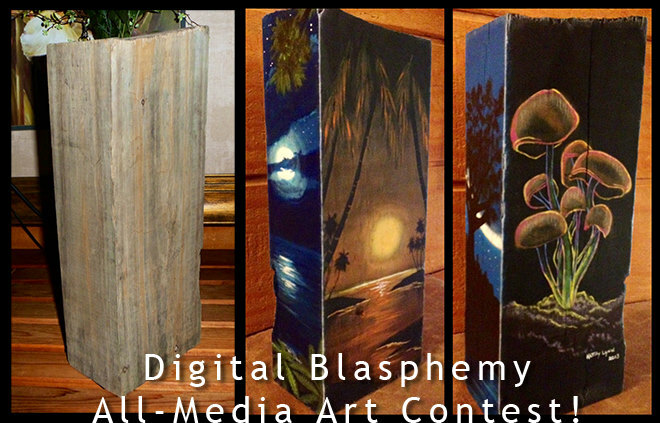 The top 7 entries will recieve Digital Blasphemy Gift Certificates (1st place is a 1-yr Membership, the other 6 are 1-month). I will choose one Grand Prize winner who will receive a Lifetime Membership Gift Certificate. The contest is open to all media and the deadline for entries is 7/5/13. I will announce the winners 7/7/13. After many, many requests I have added 1080 x 1920 images designed for the Samsung Galaxy S4 and HTC One to the gallery. There are over 155 images available in the gallery plus a few more in the Zip file. Be on the lookout for a possible update to "Starfall" over the weekend! 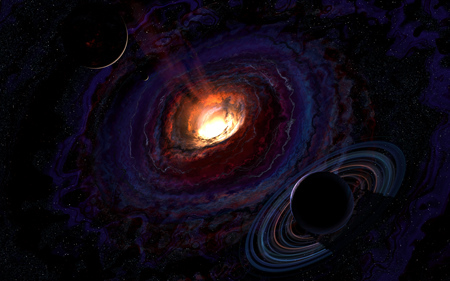 I've added "Starfall" to the Members Gallery this morning. I will leave the actual subject matter of this piece up to the viewer to decide, even though I have my own ideas. This piece was inspired by a woodcut engraving that has captured my imagination for a very long time. 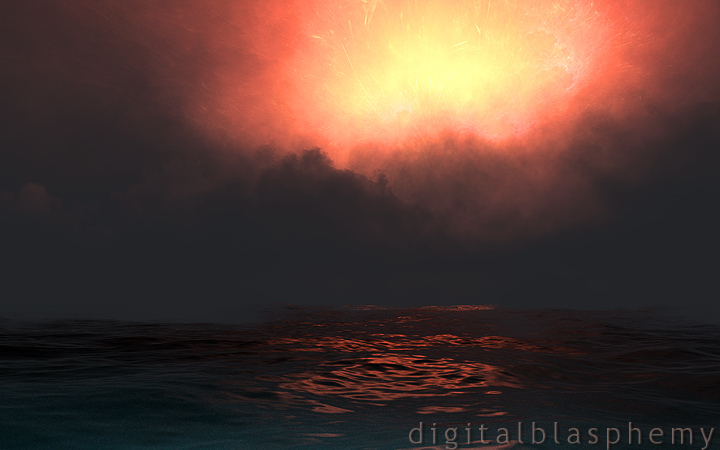 I made use of Lightwave 11.5's excellent new instancing system to create the sky while the foreground is all Vue. 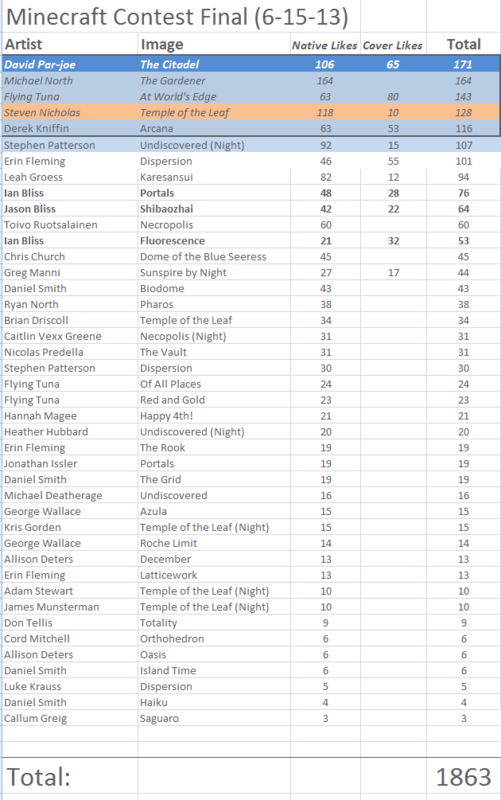 Here are the FINAL standings in the Digital Blasphemy Minecraft Contest as of 6-15 at 6pm. Thanks so much to everyone who entered and voted. Ian chose Steven Nicolas's "Temple of the Leaf" as the Grand Prize winner. Steven's piece actually finished 4th in the voting so that prize will go to Stephen Patterson instead. The deadline for submissions is tonight at midnight, but I am going to extend voting until 6 pm tomorrow. I hope to have the gift certificate prizes delivered in time for Father's Day. If you like some of the other entries (below the prize threshold) you may add to the prize kitty by purchasing gift certificates and addressing them to me (rbliss@digitalblasphemy.com). Include "minecraft" in the notes and let me know if you wish to remain anonymous or not. Even if only a couple of people had entered the contest still would have been a massive success. To see so many entries is humbling and a testament to the creative power of this transcendent game. I've added my "final" version of "Asunder" to the Members Gallery tonight. The Member who didn't approve of my reusing objects from previous projects is probably really going to hate this last update. I think this particular object fits rather well here however. This particular render took over 115 hours to render at 4096 x 2560 (4K). While it was cooking on Bucephalus I zoomed in on the little easter egg I had added on Asfaloth to render an interesting Pickle Jar version. Please help judge the entries in my Minecraft Contest here!. Winners will be announced by 6/16! The contest will run until next Friday. Minecraft only (mods and texture packs allowed, but no renders). If you use mods or texturepacks please include them in your description. My kids may ask to play in your map after the contest is over so I may contact you about that... I will post my favorites here and on my Facebook page. The one with the most likes will receive a DB 1-year Gift Certificate and up to 4 runners-up will receive 1 month gift certificates. One Grand Prize winner will receive a Lifetime Membership gift certificate. This award will be chosen by my son Ian. I saw this contest as a way of showing him the connections between my work and his game and it has succeeded beautifully so far. Simply purchase the prizes as Gift Certificates and address them to rbliss@digitalblasphemy.com. Include any instructions you would like (and if you would like to remain anonymous or not). I've added an updated version of "Asunder" to the Members Gallery this evening, going in a different direction than the chaotic "noodle" version. I will leave the first version in the Pickle Jar as a curiosity. Still exploring my options with this one. Let me know what you think of the update! Not long after I put together the new version of "Roche Limit" I thought it would be fun to create a view "from the ground". For this one, though, I thought I would get away from the placid tropical scenes. 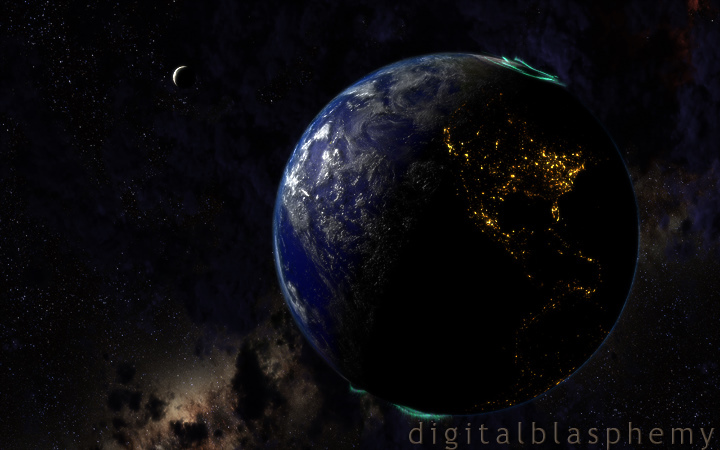 I wanted instead to depict a world on the very edge of being ripped apart be the tidal forces of a huge nearby planet. The result is finally up in the Members Gallery this evening. Believe it or not, as I was researching a proper name for this piece I learned that the landscape I imagined is not entirely fantastical! Lightwave 11's excellent new instancing tools put me in the mind to update one of my favorite space scenes, "Roche Limit". The render is new in the Members Gallery this evening. My first attempt at planet rings was back in 1998 using Bryce and I last updated it in 2004 (free version here). If you are curious the "Roche Limit" is he minimum distance from a planet a moon can be before tidal forces crush it to smithereens (forming rings). I hope you enjoy the update. Don't be surprised if I do a few different renders of this particular system. I've decided to take my venerable "User Gallery" in a different direction. Where in the past I displayed renders by users inspired by my artwork, I would like to start showcasing some of the incredible systems put together by my Members. I've seen quite a few over the past 10 years and would like to collect them all in one place. 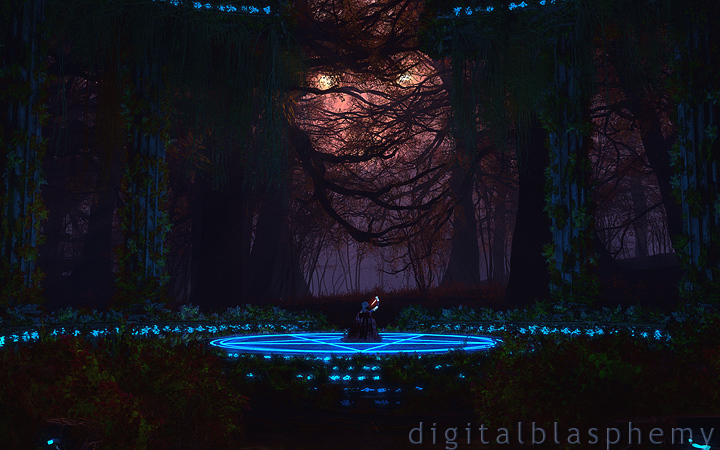 I've added a night version of "Sakura" to the Members Gallery this morning (Dual and Triple-Screen Now Available!). 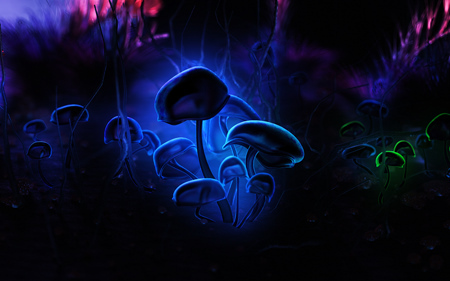 It was my original intention to create a night scene that used some of the same "bio-luminescence" from "Satori". I played around with quite a few different textures on the petals (see the blue Pickle Jar version here). The results, however, were underwhelming. The idea struck me as I was falling asleep one night to light the scene from beneath and that's when I thought up the floating lanterns. Fortunately I remembered my idea the next morning. I modeled the lanterns in Lightwave, imported them to my scene and set up the lights. I have to admit that my first test renders really took my breath away. I have couple of different projects cooking right now. One is a night version of "Sakura" that I think will look really great when it's finished rendering (fingers crossed that it finishes successfully soon!). I did a few experimental "Sakura" renders in preparation for my night scene and one of them (a day render with blue blooms) looked Pickle Jar worthy to me. I've posted a single-screen render this morning for my Members to download. Added "Jelly (2013)" to the Members Gallery this afternoon. Dual and triple-screen images are available. I've wanted to update my jellyfish from 2000 for quite a while now but for some reason never got around to it. Believe it or not I Googled "jelly fish" before I started this update to do a little research and my old render showed up on the first page of results! Anyway, I was aiming for a bit more color this time around and to create a better sense of depth. I've played with adding more than one of these creatures to the scene but I think it works nicely with one (and works better as a homage to the original). Let me know what you think of the update! Around where I live we are still waiting impatiently for Spring to arrive. I've gotten so tired of the cold and gloom that I thought it would be therapeutic to create a new Spring wallpaper. I've added "Sakura (2013)" to the Members Gallery this morning. I've wanted to update this piece for a long time, due to the fact that the cherry blossoms on the 2006 trees are actually 2D planes that lose detail closer to the camera. Vue 11's new "360 Ecosystems" finally allows me to create a proper flowering tree using 3D blooms. I've used this tech so far to create Christmas lights and a few glowing blooms but this is my first attempt at cherry trees. This render itself is actually a "first draft" and there are a few aspects that I would still like to tweak, but I thought it came out nice enough to share while I render my revisions. If you are curious, the scene contains over 98 billion polygons and took over 38 hours to render at 4096 x 2560. I'm hoping to cut down the render time for future versions. Let me know what you think in the comments. I hope you like it!! New Resolution:A lot of Members have been asking me if I could cover the new 21:9 (2560 x 1080) monitors that are coming out so I have finally added around 90 of my latest wallpapers in this format. You will find them in the "single screen" column on the image pages and the zip file is available at on the Downloads page. By request, here's a day version of my Arrakeen render. Of course, my original vision was far darker and more ominous but I do like to provide options. I tried to make this one as bright as the other was dark so to provide a true contrast. If you swap between the two images quickly you would probably notice that some building and rocks have moved. The reason for this is that certain elements looks fine in the shadows but needed to be retooled for the day version. Hopefully it isn't too jarring for folks. And yes, the center figure hasn't moved. Let me know which version you prefer! Sticking with the "minimalist" theme, I have added "Arrakeen" to the Members Gallery this afternoon. Dual and triple-screen versions are also available. This piece was inspired by one of my all-time favorite novels: Frank Herbert's "Dune". I realize it is a bit dark in spots, but I wanted a good deal of shadow between the desert and the Shield Wall. I still have the hard-back copy of "Dune" that to my Mom gave me for Christmas way back in 1984 and I try to read it every few years. The movie was ok but no adaptation will ever compare to the sights I conjured in my mind while reading it all those years ago. Anyway, I hope you enjoy my simple homage to one of my favorite works of art. "Would it be possible to do an abstract at some point that is more minimalist? Generally I love the incredible amount of detail that is everywhere in your work, but for some types of wallpapers (mobile mostly) I prefer things which are towards the minimalist side, and abstracts seem like the perfect place for that." I decided to try it out so I put together something very quickly, very "minimally", in Lightwave. I only used Lightwave's "Textured Environment" for this piece, no geometry at all, and I previewed it for my Members a couple of days ago. The feedback was generally positive so I kept tinkering. This "finished" version is a bit more complex than I had originally intended but the construction is still fairly minimalist. 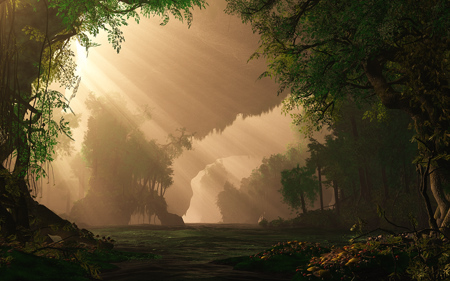 I added a single 2D plane and some volumetric lights so it is technically a "3D wallpaper". All in all it was a fun exercise and nice to render something that only takes 30 min instead of 30 hours. I will try to have a multiscreen up shortly along with some of the early versions. Hope you enjoy it!! 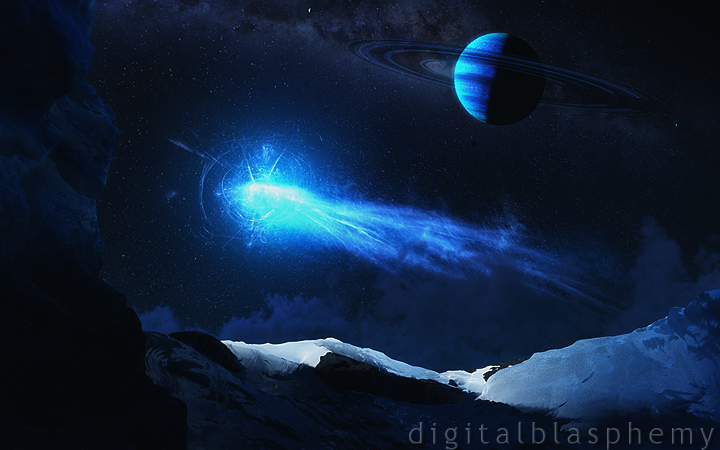 I've added some more glow to accretion disk in this version. 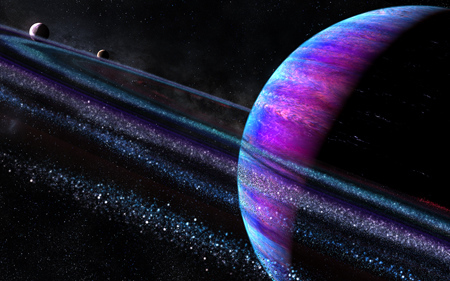 I've also brightened the shadow on the gas giant's ring system. The first version can still be found in the Pickle Jar. I will most likely add a version without the planets before all is said and done. UPDATE:I've posted a version without the planets by popular request. A number of folks seemed perplexed by the planets that I added to my 2013 "Singularity" update. The original did fine without them of course, but I added them to this scene because I wanted to try a "from the ground" render. 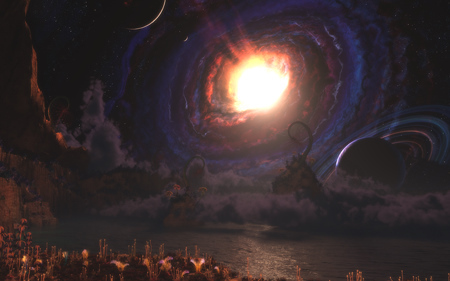 This is where I render a space scene using Lightwave (or Vue) and then use it as a sky object in a Vue scene. That render took Vue a little longer than I had anticipated (84 hrs!) but it is complete and now available to my Members. 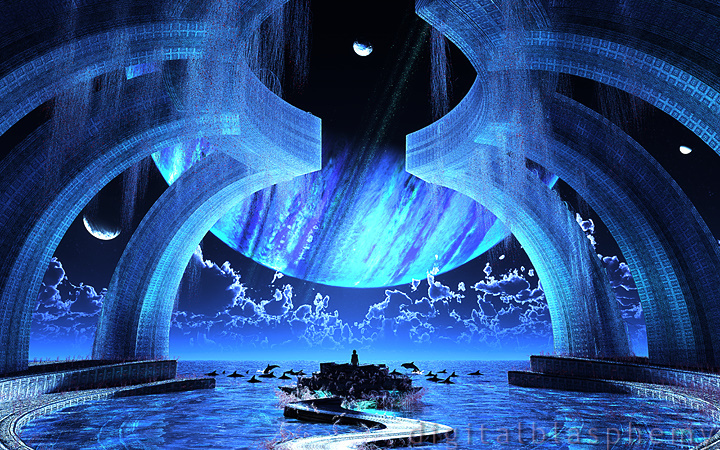 I'm calling this one "Singularity Rising" (for now) bit that may change as I make some revisions. I hope the issues that were pointed out for "Singularity" are minimized (or at least partially explained) in this planetary render. Perhaps I will go back and render a version without the planets? I've been working on a new space scene over the past few days. As with all of my space projects, there comes a point where it looks pretty good as the view out of spaceship window. Then I must make the decision to be happy with that or press on a render a view "from the ground". "Phraxis", for example, looks great by its own but "Phraxis Moon" is rated higher. The new piece is an update to one of my old favorites, "Singularity". I am already working on a view from the ground but I thought the space view looked nice to enough to compete for a gallery spot all on its own. My Members can now preview my in-progress work before it hits the main gallery here. The fine folks at Disruptive Media have added four new animated PS3 themes to the PSN Store. Themes are listed under "Games" if you want to find these for yourself. I love the animated effects! Added "Lucky Charm" to the Members Gallery this evening. A lot of folks have been asking me if I could create a new St. Patrick's Day wallpaer, and I thought it would be fun to do a night version of my "Cloverscape" sort of in the same mode as my "Pandora" version of "Satori". 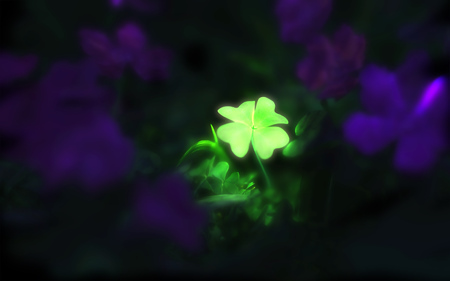 I've zoomed in quite a bit on the four-leaf clover from the original scene and gotten a bit fanciful with the lightning. A lot of people never noticed the four-leaf clover in the 2010 version so perhaps this will help point the way. The title, by the way, is borrowed from my 2001 Lightwave render but you'll probably agree that the two images are quite different. Here's a little something for my abstract fans. I've been playing around with a free program called Jenn3D this week and produced this render in Lightwave 11.5 using some of the shapes I created. I call it "Geomancy" (abstracts are so hard to title). I hope you enjoy it. Have a look at the 4K render if you are running multiple portrait monitors. I have long provided images designed to fit multiple monitors. Over the past few years, however, more and more folks have been using multiple "portrait" oriented monitors and those (with their increased vertical resolution) were harder for me to provide. No longer! As of last evening I have started added "4K" renders to the Members Gallery. These are sized at 4096 x 2560 and should accommodate up to 3 1200 x 1920 monitors placed side-by-side. I have 27 uploaded so far but I will be adding more today and tomorrow. I don't have every image available at this resolution but I will add the ones I have and all new uploads will be available at this size. So, can you use the larger images? A lot of folks mentioned that my "Satori (Night)" reminded them of the movie "Avatar". So many, in fact, that I thought it would be fun to do a "full Pandora" render. This wallpaper is started out in the Pickle Jar but most people preferred it to my more Earthbound version. Thanks for your comments and ratings! ALSO: I have extended my "New Member Special" until Friday. Use the coupon code "firsttime" to save 30% on the Membership of your choice. 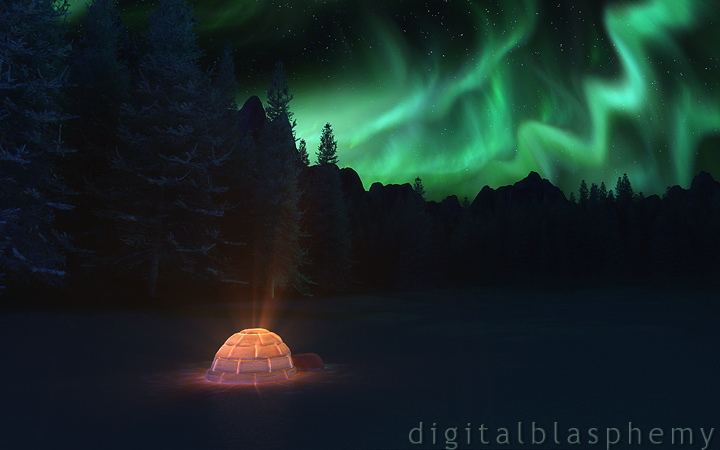 I've added a night version of "Satori" to the Members Gallery this morning. I thought this one was a pretty good candidate for "Nightening" but it actually turned out to be somewhat complicated. 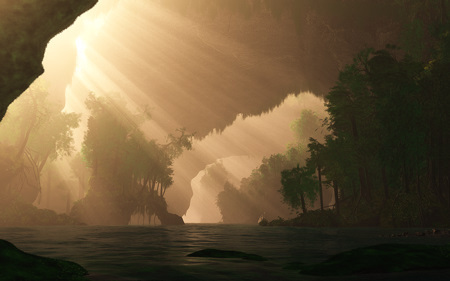 My original idea for this piece was the bottom of a cenote and (to be honest) the scene is still set up that way. This means I am a bit restricted in how I can place the moonlight. I hope it doesn't look too dark. I did some fireflies to brighten things up a bit. Anyway, I hope you enjoy it. I will be rendering the multiscreen shortly and then onto new projects! Site News: I wanted everyone to know that I enabled PayPal's "Bill-Me-Later" program over the weekend. It allows you to take up to 6 months to pay for purchases $99 and up and can be used to acquire the Lifetime DB Membership you have always wanted!. In addition, if it is your first time using "Bill-Me-Later" they will knock $10 off the price. Hard to believe it has been 10 years since I rendered the original "Satori" using World Builder 3. The company that made World Builder went out of business unfortunately and I haven't been able to use the software since 2005. 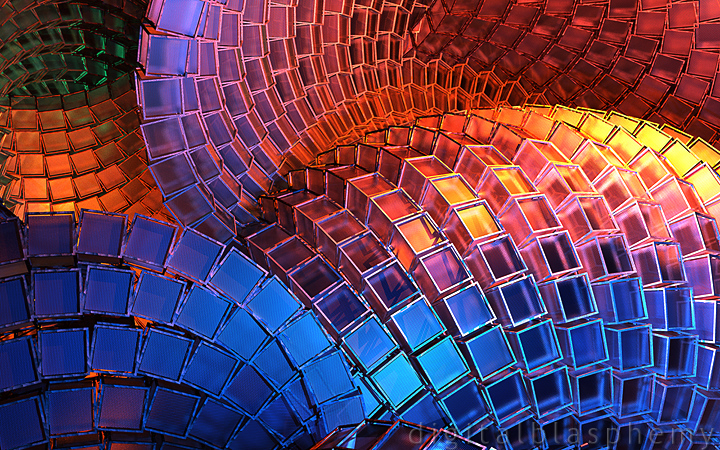 This update was created and rendered using Vue d'Esprit 11 Infinite. There are (as always) some things I would still like to tweak. You can find the original "Satori" in the Free Gallery here for comparison. -- I've added dual and triple-screen variants to the Members Gallery this afternoon. Hope you enjoy them! -- Version 3 is up this morning and I am much closer to happy with it. I've cut back on the global illumination so the shadows are a bit deeper. I've also added some purple blooms in the tree to break up the green even more. -- I've added a second draft this morning. 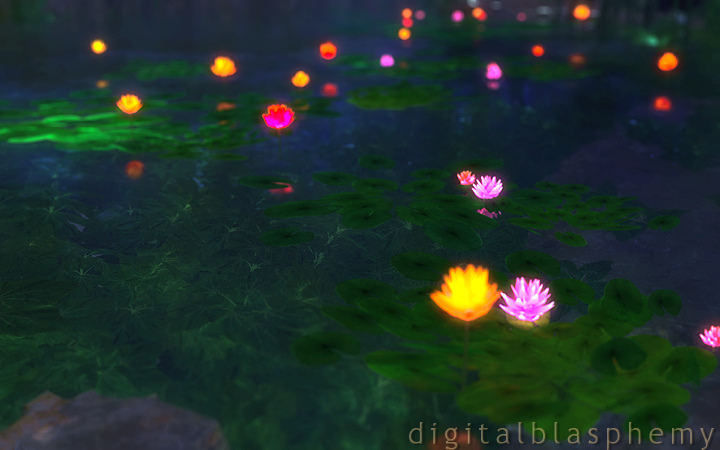 I have tweaked the tree a bit and added some lilies to the pond. I've also cut back on the saturation a bit. I cranked up the atmosphere quality settings for this one so it should be less grainy. Unfortunately that resulted in the image taking 25 hours to render (at 4096 x 2560) rather than 10 hours for the first version. I hope it was worth it! I've added "The Forgotten Way" to the Members Gallery this afternoon. The weather in Illinois has been especially cold and grey recently and this piece is a definite reaction to my cabin fever. Dual and triple-screen versions are also available. I'm still working out the lighting on this one so don't be surprised to see a variation or two over the next few days. Let me know what you think! I am offering a free Lifetime membership (or upgrade) to the person who writes the best haiku based on one of my wallpapers. Simply post your haiku in the comments section for the above image on my Facebook page along with a link to the wallpaper in my gallery that inspired you. The link should be in the form http://digitalblasphemy.com/preview.shtml?i=haiku2k72 (copy/paste it from your address bar is the easiest way to do this). The writer with the most likes by 5pm (CDT) will win the Lifetime Membership and the next two will win 1 year Memberships (or renewals). Yes, your haiku must be in the 5-7-5 syllable format to win. 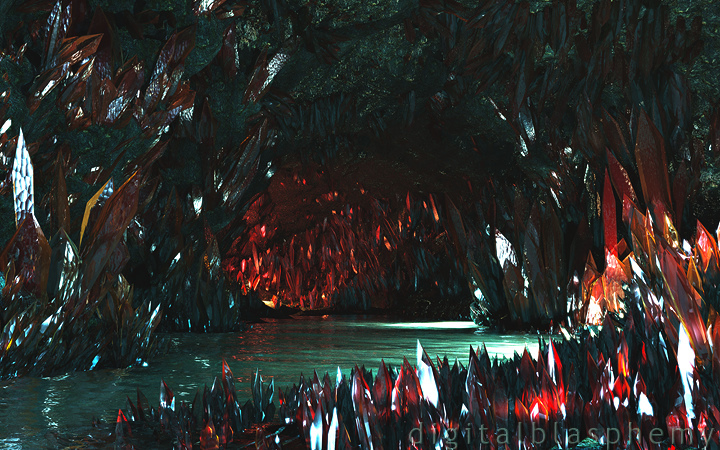 Added "Valinor" to the Members Gallery this morning. I've also posted a free 1024 x 1024 iPad version on Reddit. If you read J.R.R. Tolkien's "Lord of the Rings" and "The Hobbit" you will see references made to the long history of the Middle Earth. This history is laid out in a book called "The Silmarillion". The first beings were the "Valar", and were analagous to the demi-gods of Earth mythology. They walked under dark skies without Sun or Moon however. Iluvatar (the Supreme Being) and the Valar made many attempts to illuminate the world, but these were opposed by Melkor (who was the forebearer of Sauron). The first light was made by two massive lamps on either end of the world, but these were cast down and destroyed by Melkor. 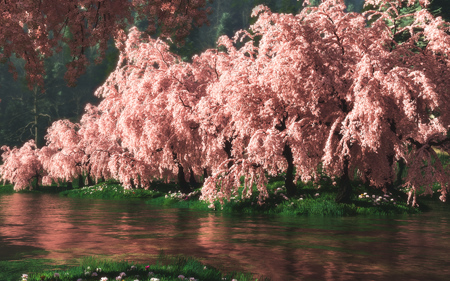 The second attempt came in the form of two brilliant trees which shone over the Valinor. 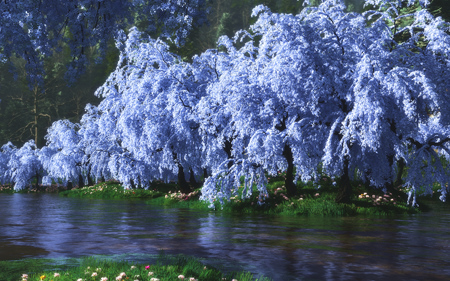 The silver tree was called "Telperion" and seeds taken from it eventually grew into the White Tree of Gondor. The gold tree was called Laurelin. A shining dew fell from the each tree which the Valar collected in wells. The light of the Two Trees was captured in three brilliant jewels called "Silmarils" which afterwards became the source of much fighting and discord. Frodo is given the Phial of Galadriel , which contains the captured light of a Silmaril (and by extenstion the Trees). 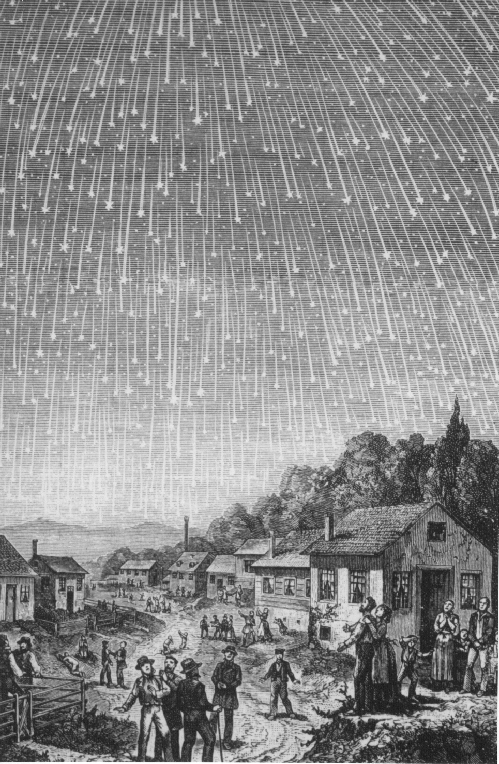 In seven hours the glory of each tree waxed to full and waned again to naught; and each awoke once more to life an hour before the other ceased to shine. Thus in Valinor twice every day there came a gentle hour of softer light when both trees were faint and their gold and silver beams were mingled. 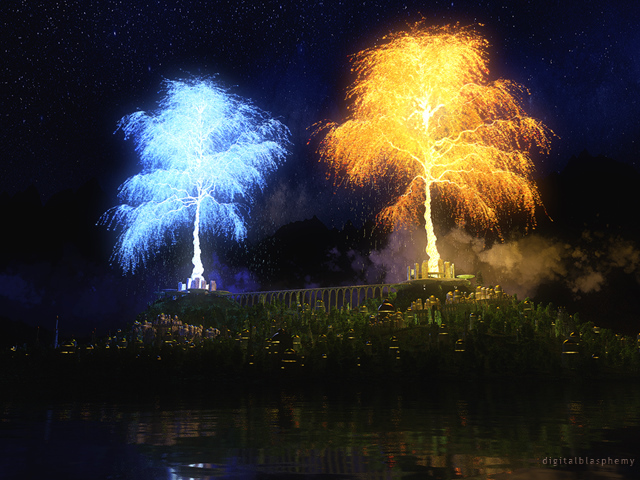 The Two Trees have always captured my imagination and I've been meaning to render this scene for a long time. I'm glad to finally get it started! As always, I took quite a few liberties with this piece but I hope it is enjoyable even if you aren't familiar with the history of Middle-Earth.